Built to the same exemplary standards as the Bavarian company's famous flat-twins, the single-cylinder BMW first appeared in pre-war days. Indeed, BMW's first new post-war model was a single-cylinder design - the 250cc BMW R24 - which arrived in 1948. 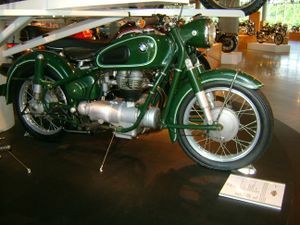 In 1956 BMW introduced a completely revamped thumper replacing the BMW R25, the R26 (engine numbers 340 001 – 370 236), with improvements paralleling those introduced at the same time in the boxer twins. The R26 came with an enclosed drive shaft, rear swingarm, and front Earles forks. A new headlight nacelle came with a sliding black plastic over the ignition key, and the “bell-bottom” front fender was dropped along with the mechanics' hand shifter. The engine of the R26 was bolted directly to the frame, and produced 15 hp (11 kW). These machines like other single cylinder BMW's were famous for their reliability, economy, and quiet operation, a very desirable feature when used for law enforcement in metropolitan areas. This page was last edited on 20 January 2011, at 19:51.